. "Charlottetown Accord: Document". The Canadian Encyclopedia, 14 October 2014, Historica Canada. https://www.thecanadianencyclopedia.ca/en/article/charlottetown-accord-document. Accessed 18 April 2019. This is a product of a series of meetings on constitutional reform involving the federal, provincial and territorial governments and representatives of Aboriginal peoples. 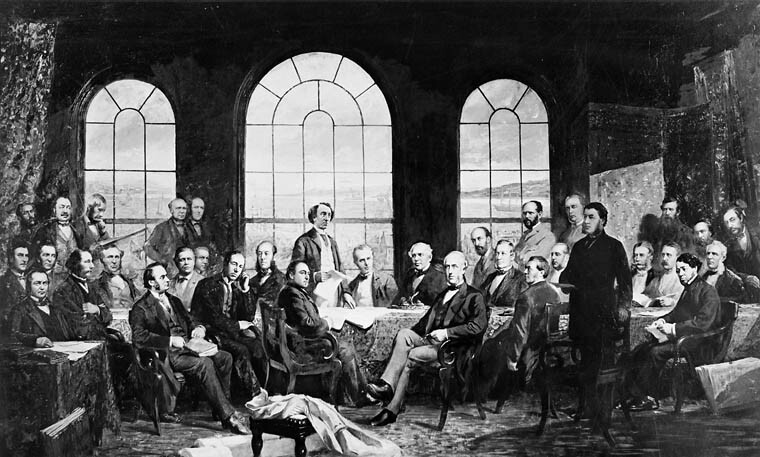 These meetings were part of the Canada Round of constitutional renewal. On September 24, 1991, the government of Canada tabled in the federal Parliament a set of proposals for the renewal of the Canadian federation entitled "Shaping Canada's Future Together." These proposals were referred to a Special Joint Committee of the House of Commons and the Senate which travelled across Canada seeking views on the proposals. The Committee received 3000 submissions and listened to testimony from 700 individuals. During the same period, all provinces and territories created forums for public consultation on constitutional matters. These forums gathered reaction and advice with a view to producing recommendations to their governments. In addition, Aboriginal peoples were consulted by national and regional Aboriginal organizations. An innovative forum for consultation with experts, advocacy groups and citizens was the series of six televised national conferences that took place between January and March of 1992. Shortly before the release of the report of the Special Joint Committee on a Renewed Canada, the Prime Minister invited representatives of the provinces and territories and Aboriginal leaders to meet with the federal Minister of Constitutional Affairs to discuss the report. At this initial meeting, held March 12, 1992 in Ottawa, participants agreed to proceed with a series of meetings with the objective of reaching consensus on a set of constitutional amendments. It was agreed that participants would make best efforts to reach consensus before the end of May, 1992 and that there would be no unilateral actions by any governments while this process was under way. It was subsequently agreed to extend this series of meetings into June, then into July. To support their work, the heads of delegation agreed to establish a Coordinating Committee, composed of senior government officials and representatives of the four Aboriginal organizations. This committee, in turn, created four working groups to develop options and recommendations for consideration by the heads of delegation. Recommendations made in the report of the Special Joint Committee on a Renewed Canada served as the basis of discussion, as did the recommendations of the various provincial and territorial consultations and the consultations with Aboriginal peoples. Alternatives and modifications to the proposals in these reports have been the principal subject of discussion at the multilateral meetings. Organizational support for the full multilateral meetings has been provided by the Canadian Intergovernmental Conferences Secretariat. In the course of the multilateral discussions, draft constitutional texts have been developed wherever possible in order to reduce uncertainty or ambiguity. In particular, a rolling draft of legal text was the basis of the discussion of issues affecting Aboriginal peoples. These drafts would provide the foundation of the formal legal resolutions to be submitted to Parliament and the legislatures. In areas where the consensus was not unanimous, some participants chose to have their dissents recorded. Where requested, these dissents have been recorded in the chronological records of the meetings but were not recorded in this summary document. Asterisks in the text that follows indicate areas where the consensus is to proceed with a political accord. A new clause should be included assaction 2 of the Constitution Act, 1867 that would express fundamental Canadian values. The Canada Clause would guide the courts in their future interpretation of the entire Constitution, including the Canadian Charter of Rights and Freedoms. (h) Canadians confirm the principal of the equality of the provinces at the same time as recognizing their diverse characteristics. (2) The role of the legislature and government of Quebec to preserve and promote the distinct society of Quebec is affirmed. The Constitution should be amended to provide that Senators are elected, either by the population of the provinces and territories of Canada or by the members of their provincial or territorial legislative assemblies. Federal legislation should govern Senate elections, subject to the constitutional provision above and constitutional provisions requiring that elections take place at the same time as elections to the House of Commons and provisions respecting eligibility and mandate of senators. Federal legislation would be sufficiently flexible to allow provinces and territories to provide for gender equality in the composition of the Senate. Matters should be expidited in order that Senate elections be held as soon as possible, and, if feasible, at the same time as the next federal general election for the House of Commons. 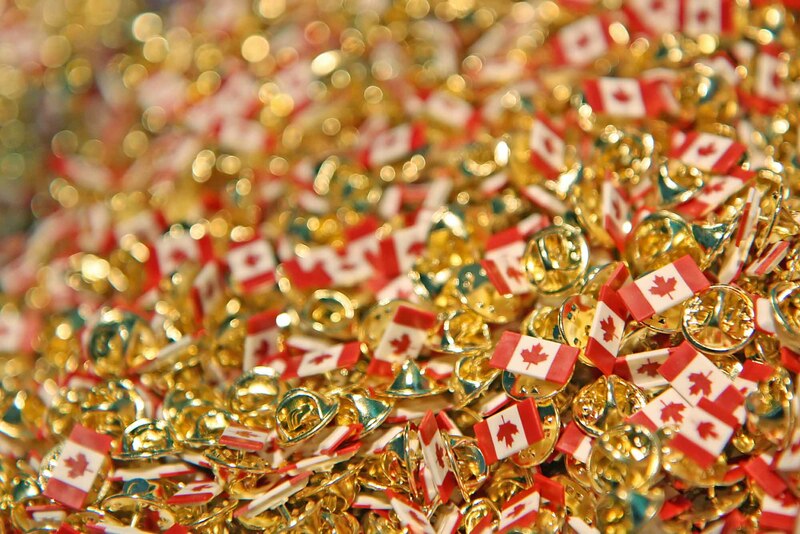 A provision should be added to the Constitution stipulating that the Government of Canada must provide reasonable compensation to the government of a province that chooses not to participatew in a new Canada-wide shared-cost program that is established by the federal government in an area of exclusive provincial jurisdiction, if that province carries on a program or inititiative that is compatible with the national objectives. (d) ensure equality of treatment of the provinces, while recognizing their different needs and circumstances. The Constitution should commit First Ministers to establishing such a framework at a future conference of First Ministers. Once it is established, First Ministers would assume a role in annually reviewing progress in meeting the objectives set out in the framework. A provision should be added (as Section 106A(3)) that would ensure that nothing in the section that limits the federal spending power affects the commitments of Parliament and the Government of Canada that are set out in Section 36 of the Constitution Act, 1982. Note: References to the territories will be added to the legal text with respect to this section, except where clearly inappropriate. Nothing in the amendments would extend the powers of the territorial legislatures. The Constitution should be amended to recognize that the Aboriginal peoples of Canada have the inherent right of self-government within Canada. This right should be placed in a new section of the Constitution Act, 1982, section 35.1(1). The recognition of the inherent right of self-government should be interpreted in light of the recognition of Aboriginal governments as one of three orders of government in Canada. so as to determine and control their developments as peoples according to their own values and priorities and ensure the integrity of their societies. Before making any final determination of an issue arising from the inherent right of self-government, a court or tribunal should take into account the contextual statement referred to above, should enquire into the efforts that have ben made to resolve the issue through negotiations and should be empowered to order the parties to take such steps as are appropriate in the circumstances to effect a negotiated resolution. Note: All the following changes to the amending formula require the unanimous agreement of Parliament and the provincial legislatures. Amendments to provisions of the Constitution related to the senate should require unanimous agreement of Parliament and the provincial legislatures, once the current set of amendments affecting the House of Commons, including Quebec's guarantee of 25 percent of the seats in the House of Commons, and amendments which can now be made under Section 42 should also require unanimity. Sections 41 and 42 of the Constitution Act, 1982 should be amended so that the nomination and appointment process of Supreme Court judges would remain subject to the general (7/50) amending procedure. All other matters related to the Supreme Court, including its entrenchment, its role as the general court of appeal and its composition, would be matters requiring unanimity. Other constitutional issues were discussed during the multilateral meetings. • changes to the "notwithstanding clause"
The current provisions of the amending formula governing the creation of new provinces should be rescinded. They should be replaced by the pre-1982 provisions allowing the creation of new provinces through an Act of Parliament, following consultation with all of the existing province at a First Ministers' Conference. New provinces should not have a role in the amending formula without the unanimous consent of all the provinces and the federal government. Territories that become provinces could not lose Senators or members of the House of Commons. The provision now contained in Section 42(1)(e) of the Constitution Act, 1982 with respect with the extension of provincial boundaries into the Territories should be repealed and replaced by ths Constitution Act, 1871, modified in order to require the consent of the Territories. Where an amendment is made under the general amending formula that transfers legislative powers from provincial legislatures to Parliament, Canada should provide reasonable compensation to any province that opts out of the amendment. There should be Aboriginal consent to future constitutional amendments that directly refer to the Aboriginal peoples. discussions are continuing on the mechanism by which this consent would be expressed with a view to agreeing on a mechanism prior to the introduction in Parliament of formal resolutions amending the Constitution. The Charter provision dealing with Aboriginal peoples (section 25, the non-derogation clause) should be strengthened to ensure that nothing in the Charter abrogates or derogates from Aboriginal, treaty or other rights of Aboriginal peoples, and in particular any rights or freedoms relating to the exercise or protection of their languages, cultures or traditions. A separate constitutional amendment requiring only the consent of Parliament and the legislature of New Brunswick should be added to the Canadian Charter of Rights and Freedoms. The amendmant would entrench the equality of status of the English and French linguistic communities in New Brunswick, including the right to distinct educational institutions and such distinct cultural institutions as are necessary for the preservation and promotion of these communities. The amendment would also affirm the role of the legislature and government of New Brunswick to preserve and promote this equality of status. A new provision should be added to the constitution describing the commitment of the governments, Parliament and the legislatures within the federation to the principle of the preservation and development of Canada's social and economic union. The new provision, entitled the Social and Economic Union, should be drafted to set out a series of policy objectives underlying the social and the economic union, respectively. The provision should not be justiciable. • protecting, preserving and sustaining the integrity of the environment for present and future generations. • ensuring sustainable and equitable development. A mechanism for monitoring the Social and Economic Union should be determined by a First Minister's Conference. A clause should be added to the Constitution stating that the Social and Economic Union does not abrogate or derogate from the Canadian Charter of Rights and Freedoms. Parliament and the Government of Canada are commited to making equalization payments so that provincial governments have sufficient revenues to provide reasonably comparable levels of public services at reasonably comparable levels of taxation. Subsection 36(1) should be expanded to include the territories. Subsection 36(1) should be amended to add a commitment to ensure the reasonably comparable economic infrastructures of a national nature in each province and territory. The Constitution should commit the federal government to meaningful consultation with the provinces before introducing legislation relating to equalization payments. A new Subsection 36(3) should be added to entrench the commitment of governments to the promotion of regional economic development to reduce economic disparities. Regional development is also discussed in item 36 of this document. Section 121 of the Constitution Act, 1867 would remain unchanged. Delaying the justiciability of the right should be coupled with a constitutional provision which would shield Aboriginal rights. Delaying the justiciability of the right will not make the right contingent and will not affect existing Aboriginal and treaty rights. The Canadian Charter of Rights and Freedoms should apply immediately to governments of Aboriginal peoples. A technical change should be made to the English text of Sections 3, 4 and 5 of the Canadian Charter of Rights and Freedoms to ensure that it corresponds to the French text. The legislative bodies of Aboriginal peoples should have access to section 33 of the Constitution Act, 1982 (the notwithstanding clause) under conditions that are appropriate to the circumstances of Aboriginal peoples and their legislative bodies. The specific constitutional provision on the inherent right and the specific constitutional provision on the commitment to negotiate should not create new Aboriginal rights to land or derogate from existing aboriginal or treaty rights to land, except as provided for in self-government agreements. There should be a constitutional commitment by the federal and provincial governments and the Indian, Inuit and Metis peoples in the various regions and communities of Canada to negotiate in good faith with the objective of concluding agreements elaborating the relationship between Aboriginal governments and the other orders of government. The negotiations would focus on the implementations of the right of self-government including issues of jurisdiction, lands and resources, and economic and fiscal arrangements. • All Aboriginal peoples of Canada should have equitable access to the process of negotiations. • Self-government negotiations should be initiated by the representatives of Aboriginal peoples when they are prepared to do so. • Self-government negotiations should take into consideration the different circumstances of the various Aboriginal peoples. • Self-government agreements should be set out in future treaties, including land claims agreements or amendments to existing treaties, including land claims agreements. In addition, self-government agreements could be set out in other agreements which may contain a declaration that the rights of Aboriginal peoples are treaty rights, within the meaning of Section 35(1) of the Constitution Act, 1982. • There should be an approval process for governments and Aboriginal peoples for self-government agreements, involving Parliament, the legislative assemblies of the relevant provinces and/or territories and the legislative bodies of the Aboriginal peoples. This principle should be expressed in the ratification procedures set out in the specific self-government agreements. • There should be an explicit statement in the Constitution that the commitment to negotiate does not make the right of self-government contingent on negotiations or in any way affect the justiciability of the right of self-government. A constitutional provision should ensure that federal and provincial laws will continue to apply until they are displaced by laws passed by governments of Aboriginal peoples pursuant to their authority. A constitutional provision should ensure that a law passed by a government of Aboriginal peoples, or an assertion of its authority based on the inherent right provision may not be inconsistent with those laws which are essential to the preservation of peace, order and good government in Canada. However, this provision would not extend the legislative authority of Parliament or of the legislatures of the provinces. • it should be provided that these treaty amendments shall not extend the authority of any government or legislature, or affect the rights of Aboriginal peoples not party to the treaty concerned. The Constitution should provide that all of the Aboriginal peoples of Canada have access to those Aboriginal and treaty rights recognized and affirmed in Section 35 of the Constitution Act, 1982 that pertain to them. • providing essential public services at levels reasonably comparable to those available to other Canadians in the vicinity. It would also commit federal and provincial governments to the principle of providing the governments of Aboriginal peoples with fiscal or other resources, such as land, to assist those governments to govern their own affairs and to meet the commitments listed above, taking into account the levels of services provided to other Canadians in the vicinity and the fiscal capacity of governments of Aboriginal peoples to raise revenues from their own sources. The Constitution should include a provision which authorizes governments of Aboriginal peoples to undertake affirmative action programs for social and economically disadvantaged individuals or groups and programs for the advancement of Aboriginal languages and cultures. The Constitution should be amended to provide for four future First Ministers' Conferences on Aboriginal Constitutional Matters beginning no later than 1996, and following every two years thereafter. These conferences would be in addition to any other First Ministers' Conferences required by the Constitution. The agendas of these conferences would include items identified in this report and items requested by Aboriginal peoples. For greater certainty, a new provision should be added to the Constitution Act, 1867 to ensure that Section 91(24) applies to Aboriginal peoples. The Constitution should be amended to safeguard the legislative authority of the government of Alberta for the Metis and Metis settlement lands. There was agreement to a proposed amendment to the Alberta Act that would constitutionally protect the status of the land held in fee simple by the Metis Settlements General Council under letters patent from Alberta. The federal government, the provinces of Ontario, Manitoba, Saskatchewan, Alberta, British Columbia and Metis National Council have agreed to enter into a legally binding, justiciable and enforceable accord on Metis Nation issues. Technical drafting of the accord is being completed. The Accord sets out the obligations of the federal and provincial governments and the Metis Nation. The Accord commits governments to negotiate: self-government agreements; lands and resources; the transfer of the portion of Aboriginal programs and services available to Metis; and cost sharing arrangements relating to Metis institutions, programs and services. Provinces and the federal government agree not to reduce existing expenditures on Metis and other Aboriginal people as a result of the Accord or as a result of an amendment to Section 91(24). The Accord defines the Metis for the purpose of the Metis Nation Accord and commits governments to enumerate and register the Metis Nation. The Constitutional should be amended to provide a mechanism to ensure that designated agreements between governments are protected from unilateral change. This would occur when Parliament and the legislature(s) enact laws approving the agreement. Each application of the mechanism would cease to have an effect after a maximum of five years but could be renewed by a vote of Parliament and the legislatures(s) readopting similar legislation. Governments of Aboriginal peoples should have access to this mechanism. The provision should be available to protect both bilateral and multilateral agreements among federal, provincial and territorial governments, and the governments of Aboriginal peoples. A government negotiating an agreement should be accorded equality of treatment in relation to any government which has already concluded an agreement, taking into account different needs and circumstances. A new provision should be added to the constitution committing the Government of Canada to negotiate agreements with the provinces relating to immigration. The Constitution should oblige the federal government to negotiate and conclude within a reasonable time an immigration agreement at the request of any province. A government negotiating an agreement should be accorded equality of treatment in relation to any government which has already concluded an agreement, taking into account different needs and circumstances. Labour market development and training should be idenified in Section 92 of the Constitution as a matter of exclusive provincial jurisdiction. Provincial legislatures should have the authority to constrain federal spending that is directly related to labour market development and training. This should accomplished through justiciable intergovernmental agreements designed to meet the circumstances of each province. At the request of a province, the federal government would be obligated to withdraw from any and all training activities, except Unemployment Insurance. The federal government should be required to negotiate and conclude agreements to provide reasonable compensation to provinces requesting that the federal government withdraw. The Government of Canada and the government of the province that requested the federal government to withdraw should conclude agreements within a reasonable time. Provinces negotiating agreements should be accorded equality of treatment with respect to terms and conditions of agreements in relation to any other province that has already concluded an agreement, taking into account the different needs and circumstances of the provinces. As a safeguard, the federal government should be required to negotiate and conclude an agreement within a reasonable time, at the request of any province not requesting the federal government to withdraw, to maintain its labour market development and training programs and activities in that province. A similar safeguard should be available to the territories. Provinces that negotiated agreements to constrain the federal spending power should be obliged to ensure that their labour market development programs are compatible with the national policy objectives, in the context of different needs and circumstances. The concerns of Aboriginal peoples in this field will be dealt with through the mechanisms set out in item 40 below. Provinces should have exclusive jurisdiction over cultural matters within the provinces. This should be recognized through an explicit constitutional amendment that also recognizes the continuing responsibility of the federal government in Canadian cultural matters. The federal government should retain responsibility for national cultural institutions. The Government of Canada commits to negotiate cultural agreements with provinces in recognition of their lead responsibility for cultural matters within the province and to ensure that the federal government and the province work in harmony. These changes should not alter the federal feduciary responsibility for Aboriginal people. The non-derogation provisions for Aboriginal peoples set out in item 40 of this document will apply to culture. Exclusive provincial jurisdiction over forestry should be recognized and clarified through an explicit constitutional amendment. Provincial legislatures should have the authority to constrain federal spending that is directly related to forestry. Such an agreement would set the terms for federal withdrawal, including the level and form of financial resources to be transferred. In addition, a political accord could specify the form the compensation would take (ie cash transfers, tax points, or others)(*). Alternatively, such an agreement could require the federal government to maintain its spending in that province. A similar safeguard should be available to the territories. The federal government should be obliged to negotiate and conclude such an agreement within a reasonable time. These changes and the ones set out in items 31, 32, 33, 34 and 35 should not alter the federal fiduciary responsibility for Aboriginal people. The provisions set out in item 40 would apply. In addition to the commitment to regional development to be added to Section 36 of the Constitution Act, 1982 (described in item 5 of this document), a provision should be added to the Constitution that would oblige the federal government to negotiate an agreement at the request of any province with respect to regional development. Such agreements could be protected under the provision set out in item 26 ("Protection of Intergovernment Agreements"). Regional development should not become a separate head of power in the constitution. The federal government should be committed to negotiate agreements with the provincial agreements to coordinate and harmonize the procedures of their respective regulatory agencies in this field. Such agreements could be protected under the provision set out in item 26 ("Protection of Intergovernment Agreements". This provision of the Constitution should be repealed. Repeal requires unanimity. Section 92(10)(c) of the Constitution Act, 1867 permits the federal government to declare a "work" to be for the general advantage of Canada and bring it under the legislative jurisdiction of Parliament. This provision should be amended to ensure that the declatory power can only be applied to new works or rescinded with respect to past declarations with the explicit consent of the province(s) in which the work is situated. Existing declarations should be left undisturbed unless all of the legislatures affected wish to take action. There should be a general non-derogation clause to ensure that division of powers amendments will not affect the rights of the Aboriginal peoples and the jurisdictions and powers of governments of Aboriginal peoples. The Senate should initially total 62 Senators and should be composed of six Senators from each province and one Senator from each territory. Aboriginal representation in the Senate should be guaranteed in the Constitution. Aboriginal Senate seats should be additional to provincial and territorial seats, rather than drawn from any province or territory's allocation of Senate seats. The Senate should not be a confidence chamber. In other words, the defeat of government-sponsored legislation by the Senate would not require the government's resignation. 4) Ordinary legislation (any bill not falling into one of the first three categories). Initial classification of bills should be by the originator of the bill. With the exception of legislation affecting French culture (see item 14), appeals should be determined by the Speaker of the House of Commons, following consultation with the Speaker of the Senate. The Constitution should oblige the Senate to dispose of any bills approved by the House of Commons, within thirty sitting days of the House of Commons, with the exception of revenue and expenditure bills. Revenue and expenditure bills would be subject to a 30 calendar-day suspensive veto. If a bill is defeated or amended by the Senate within this period, it could be repassed by a majority vote in the House of Commons on a resolution. Bills that materially affect French language culture would require approval by a majority of Senators voting and by a majority of the Francophone Senators voting. The House of Commons would not be able to override the defeat of a bill in this category by the Senate. Bills that involve fundamental tax policy changes directly related to natural resources would be defeated if a majority of Senators voting cast their votes against the bill. The Senate should have the powers set out in this Consensus Report. There would be no change to the Senate's current role in approving constitutional amendments. Subject to the Consensus Report, Senate powers and procedures should mirror those in the House of Commons. The Senate should continue to have the capacity to initiate bills, except for money bills. If any bill initiated and passed by the senate is amended or rejected by the House of Commons, a joint sitting process should be triggered automatically. The House of Commons should be obliged to dispose of legislation approved by the Senate within a reasonable time limit. In order to preserve Canada's parliamentary traditions, the Senate should not be able to block the routine flow of legislation relating to taxation, borrowing and appropriation. Revenue and expenditure bills ("supply bills") should be defined as only those matters involving borrowing, the raising of revenue and appropriation as well as matters subordinate to these issues. This definition should exclude fundamental policy changes to the tax system (such as the Goods and Services Tax and the National Energy Program). The originator of a bill should not be responsible for designating whether it materially affects French language or French culture. Each designation should be subject to appeal to the Speaker of the Senate under rules to be established by the Senate. These rules should be designed to provide adequate protection to Francophones. On entering the Senate, Senators should be required to declare whether they are Francophones for the purpose of the double majority voting rule. Any process for challenging these declarations should be left to the rules of the Senate. The Constitution should specify that the Senate ratify the appointment of the Governor of the Bank of Canada. The Constitution should also be amended to provide the Senate with a new power to ratify other key appointments made by the federal government. The Senate should be obliged to deal with any proposed appointments within thirty sitting-days of the House of Commons. An appointment subject to ratification would be rejected if a majority of Senators voting cast their votes against it. Senators should not be eligible for Cabinet posts. The Supreme Court should be entrenched in the Constitutional as the general court of appeal for Canada. The Constitution should entrench the current provision of the Supreme Court Act, which specifies that the Supreme Court is to be composed of nine members, of whom three must have been admitted to the bar of Quebec (civil law bar). The Constitution should require the federal government to name judges from lists submitted by the governments of the provinces and territories. A provision by the Constitution for the appointment of interim judges if a list is not submitted on a timely basis or no candidate is acceptable. The composition of the House of Commons should be adjusted to better reflect the principle of representation by population. The adjustment should include an initial increase in the House of Commons to 337 seats, to be made at the time Senate reform comes into affect. Ontario and Quebec would each be assigned eighteen additional seats, British Columbia four additional seats, and Alberta two additional seats, with boundaries to be developed using the 1991 census. An additional special Canada-wide redistribution of seats should be conducted following the 1996 census, aimed at assuring that, in the first subsequent general election, no province will have fewer than 95% of the House of Commons seats it would receive under strict representation-by-population. Consequently, British Columbia and Ontario would each be assigned 3 additional seats and Alberta 2 additional seats. As a result of this special adjustment, no province or territory will lose seats, nor will a province or territory which has achieved full representation-by-population have a smaller share of House of Commons seats than its share of the total population in the 1996 census. (e) The current provision that allocates two seats to the Northwest Territories and one seat to Yukon would be retained. A permanent formula should be developed and section 51 of the Constitution Act, 1867 should be adjusted to accommmodate demographic change, taking into consideration the principals suggested by the Royal Commission on Electoral Reform and Party Financing. A provision should be added to the Constitution requiring the Prime Minister to convene a First Ministers' Conference at least once a year. The agendas for these conferences should not be specified in the Constitution. The role and responsibilities of First Ministers with respect to the federal spending power are outlined at item 25 of this document. The Bank of Canada was discussed and the consensus was that this issue should not be pursued in this round, except for the consensus that the Senate should have a role in ratifying the appointment of its Governor.